O Made by Gibsons of Staffordshire in the 1950’/60’s. o Condition is generally okay. Affected by crazing glazing throughout. The gold glaze is still bright and shiny. This is a sugar bowl made by the Staffordshire pottery Gibsons. GIBSONS SUGAR BOWL. Makers marks on the base Gibsons Staffordshire England. Made in the Lustre Jasperware pattern. A lovely item that will make a great gift. Makers marks on the base Gibsons Staffordshire England. Made in the Lustre Jasperware pattern. A lovely item that will make a great gift. Made by Gibson's, Staffordshire. Textured open jug. Brown throughout with a fabulous right angled handle. Condition - Fair. Base is marked and crazing. 1 small nic to the base. Glazed stoneware, 1950s. Approx 16 cm tall, 12cm spout to handle. It is white with pink, flowers on one side, and gold trim. This teapot will make an excellent addition to any collection. There is a crack that runs through the horses as shown in photos. The Gibson backstamp is intact. This piece is in "as found" condition. Don't lose the opportunity to own this beautiful teapot and this NEW low price!! It is a wonderful vintage Gibsons teapot. It measures 6" tall and 10.25" from spout to handle. It is white with pink, flowers on one side, and gold trim. It has a chips on the cover. See picture for details. This teapot will make an excellent addition to any collection. Gibson & Sons (Ltd), Burslem UK (1885 - 1975) were earthenware manufacturers and producers of dinner and tea wares, they were particularly known for teapot manufacture. Around 1907-1910 they manufactured the 'Largest Teapot in the world'. Excellent example of a Gibsons small rustic jug. No chips or cracks. Approx 3.5" high x 3.5" across including handle. 2 HANDLED MOTTLED. LIDDED SUGAR BOWL. (INCLUDING HANDLES & LID). (1950's-1960's). A little under glaze cracking. On base is W206 with Staffordshire markings. 2 x Vintage Brown Jugs Gibsons Staffordshire/Arthur Wood; SUPERB; 5.5" & 4"
GIBSONS GEORGIAN. GORGEOUS SILVER LUSTRE GLAZE. JUST A CHIP ON THE UNDERSIDE OF THE LID. Back stamped Staffordshire Gibson's England. Small 12 cms tall x 16 cms handle to spout. Smooth top with textured base. Back stamped for Gibson England. ANTIQUE GIBSONS STAFFORDSHIRE. RED CLAY MADE BY GIBSONS ENGLAND. SILVER LUSTRE UNUSUAL TEAPOT. THOUGH A POTTERY ITEM THE GLAZE IS SILVER LUSTRE. MAKES IT A QUITE AN UNUSUAL UNIQUE ITEM. LOOKS GREAT ON DISPLAY OR BETTER STILL TO USE. The jug is in a fair used condition with a chip to the handle. Would benefit from a clean. Support the British Heart Foundation's life saving research. 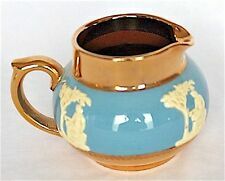 A very nice 1950's teaset from Gibsons of Staffordshire, has wear to the gilding on the teapot otherwise all is good and displaying well, size of the teapot is approx 135 mm, 5.25" tall x 240 mm, 9.5" from handle to spout. Gibson & Son 'Greek Border' Milk Jug 1/2 Pint. I don't think this set has ever been used as it's exceptionally clean on the inside. This is a stunning 3 piece tea set in lovely green colour edged with gold, it has a beautiful floral design on it. The milk jug: 10.5 cm from handle to spout and 7cm high. Tea pot: 23 cm wide from handle to spout and 12 cm high. Vintage Gibsons Staffordshire Milk Cream Jug and Sugar Dish Bowl White Wild Rose pattern. Sugar bowl in excellent condition - no chips or crazing. Jug has a few nibbles on base, cracked handle and crack coming down from rim so probably only good for decrotive purposes. Sugar bowl approx 5" across handles x 3" high. Jug approx 4.5" across handle and spout x 3" high. C 1909 pottery Silvoe art ware Gibson & sons silver luster jug. BEAUTIFUL COPPER LUSTRE TEAPOT. In Superb unmarked condition. G & S Ltd (Gibsons Burslem Pottery). New listingGIBSON'S Staffordshire England Vintage Glazed Coffee Pot. GIBSON'S Staffordshire England Vintage Glazed Coffee Pot. See photos. Some crazing and crack in lid but still a lovely vintage item. Vintage A Taunton Vale company Gibson Staffordshire England Small Cream /Milk Jug Cherub and bells type design. With silver coloured borders and handle Size approx 90 mm high by by 90 mm diameter at the widest point The jug has a fair amount of fine crazing to the glazed surface due to age and very slight discolouring to small area to the inside bottom bar that looks in good and usable condition Condition is Used . Dispatched with Hermes Tracked. Gibson & sons WILLOW Gravy Boat. In Willow pattern on a White background background with Gilt trim. Bears the Gibson & Sons England, Willow backstamp. Small bump under glazing on lid and two under glaze marks as shown in close up pictures as well as a small area where glaze was missed. Royal Harvey B ( Gibson & Sons) Staffordshire Hand Painted Bird Trinket Box Circa 50's. Makers mark on base reverse reads. 'Royal Harvey' Staffordshire England B. Gold leaf pin stripe around top of lid. 23 cm handle to spout, 13 cm tall.